July 11, 2017 – Houston might have a high of 95 degrees Fahrenheit this week, but NASA’s James Webb Space Telescope will soon be hanging out in a vibration-isolating “hammock,” with the best air conditioning available, courtesy of NASA’s Johnson Space Center in Houston. In preparation for the Webb telescope’s upcoming cryogenic testing, engineers at Johnson have suspended it from the ceiling of the center’s historic Chamber A. This “hammock” (really, six support rods attached to the platform on which the telescope is sitting) is not for relaxation; it’s meant to isolate the telescope from the vibrations Chamber A could produce once the door closes and testing begins, as well as from disturbances that might occur outside the chamber. 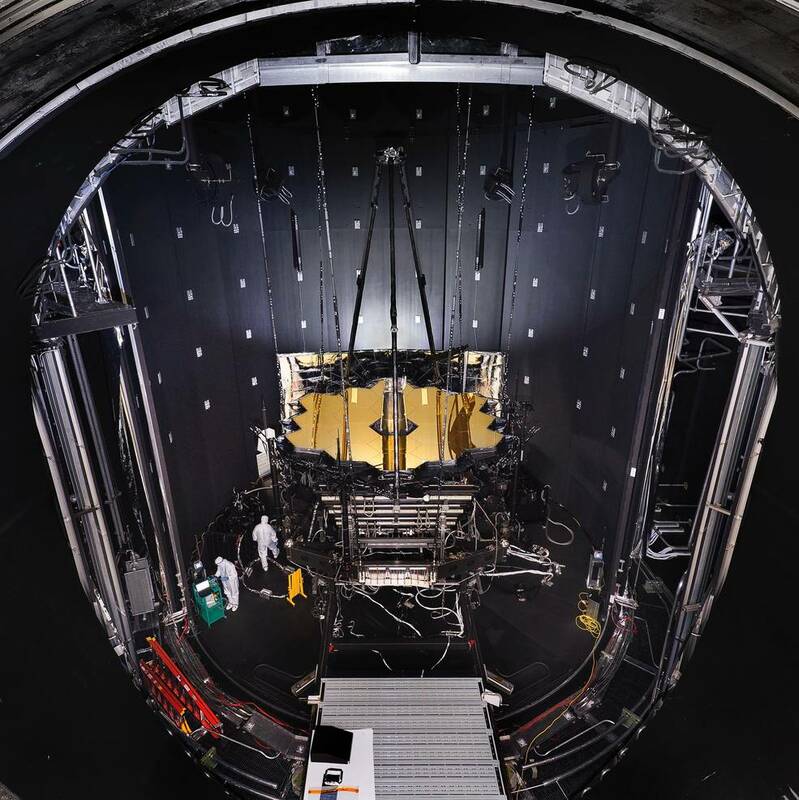 You may have a hard time seeing the Webb telescope floating in the photo, because it is suspended only a few inches from the rails on the bottom of the chamber, which were used to roll the telescope into place. What’s a hammock without a little bit of sway? With the telescope suspended, engineers conducted a “push test,” where they gave it a very slight nudge and observed how it reacted to ensure the suspension system was functioning the best it could, said Matthews. Don’t worry, the 14,000 pound telescope wasn’t swinging from one side of the chamber to the other; the nudge only amounted to a few millimeters of movement. Webb will remain suspended in the chamber for the entire cryogenic testing phase, which will last about three months. In space, the telescope must be kept extremely cold, in order to be able to detect the infrared light from very faint, distant objects. To protect the telescope from external sources of light and heat (like the sun, Earth and moon), as well as from heat emitted by the observatory, a five-layer, tennis court-sized sunshield acts like a parasol that provides shade. The sunshield separates the observatory into a warm, sun-facing side (reaching temperatures close to 185 degrees Fahrenheit) and a cold side (400 degrees below zero). The sunshield blocks sunlight from interfering with the sensitive telescope instruments.